I ALWAYS IMAGINED THAT BRUSHING MY DAUGHTERS HAIR WOULD BE - ProudMummy.com the Web's Community for Mums. 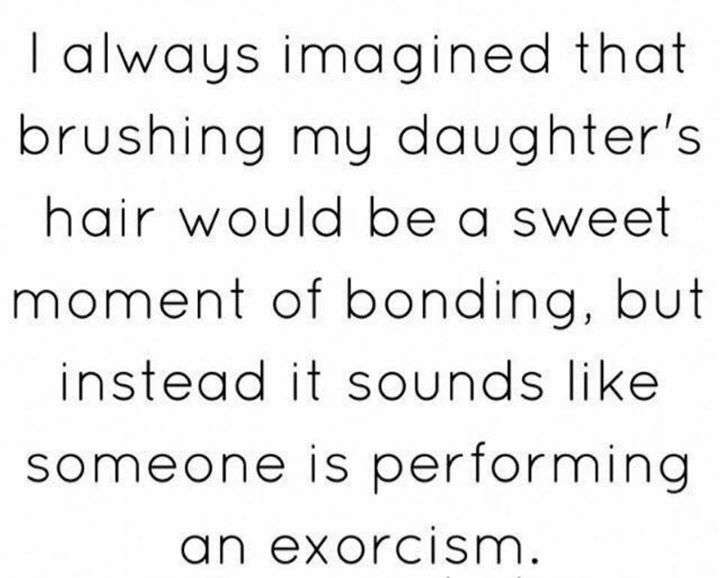 I ALWAYS IMAGINED THAT BRUSHING MY DAUGHTER'S HAIR WOULD BE A SWEET MOMENT OF BONDING, BUT INSTEAD IT SOUNDS LIKE SOMEONE IS PERFORMING AN EXORCISM. I hated brushing my daughter's waist length hair when I had to treat it for nites.in the end I had to cut it because it took too long . My daughter has thick long hair and hates me doing anything to it I have to use a special brush. And she still gos mad lol. Chris Hendry 😂 this is me with summer every morning!! I remember being on the other end of that hairbrush as it thumped a lot off my head!! Yep that's so my house. Not 1 girl but 2 now 🙈 lord help me!! If your mum is mad, never let her brush your hair! Heather Morag strike a chord with you? Pauline Stanley often wondered why I ended up with short hair!! Laura Whittaker you did it on purpose! We have this every day! Kathy O'Callaghan.. I can so relate t this. Jess Penhallow remember 'magic brush'. Yep yep and definitely yep! Bernadette O'Beirne what's it like with Ruth ? Aoife O Donnell wait it's coming..
Jade Somers ring any bells? Haha Marc 'Brux-c' Brooks Freya !! Ros Maudlin - rr ??? ?